The framed print makes a beautiful gift for any occasion, birthdays, anniversaries, christenings or corporate. 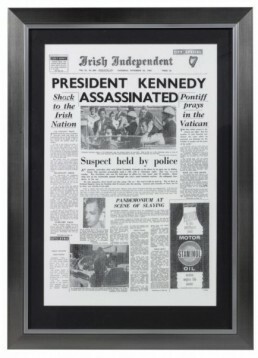 This broadsheet newspaper page of your choice is beautifully framed in a gunsilver frame with an elegant black mount. You'll be able to frame this truly unique gift for years to come. A beautifully presented reproduced copy of the front page or main news page from the newspaper and date of your choice. Presented in a gunsilver frame with black mount measuring 16" x 12" (40.5cm x 30.5cm). Please allow 3-5 working days for delivery within Ireland. Please note that some newspapers may not be available due to newspaper strikes. Please contact us before placing your order if you wish to check availability of a specific newspaper on the wedding day. The quality of the newspaper print depends on how old the newspaper is, and how it has been stored. Our team scans each newspaper's microfilm individually and it is processed through photo editing software to try to ensure each page is of good quality. Prior to 1963, the front page of the Irish Independent contained only advertisements. The main news page will be used instead. 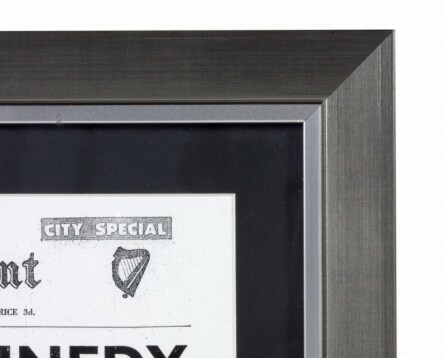 Do you need any help with this gift idea, Broadsheet Framed Newsprint?